Midlands-based Bill Bird Shoes may be better known for creating bespoke shoes for people with walking and fitting difficulties but we like our equestrian friends to be well shod too! This is why we sponsored the Ally Sadler Trophy for Best Shod Horse at Saturday’s Moreton Show, one of the biggest one-day agricultural shows in the country. 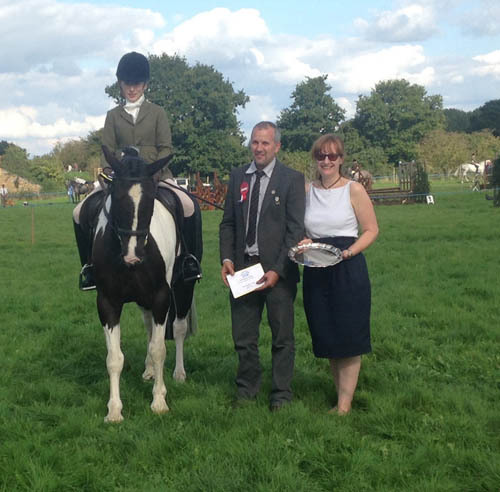 Here is Mrs H M Bailey and her horse Kempez Cwnere, who is also known as Badger, receiving their engraved silver salver from judge and expert farrier Steve Arnold and Vicki Gumbley from Bill Bird Shoes. Mr Arnold said the reason Badger’s shoes were singled out for this prestigious award was because they had been excellently crafted by hand, rather than machine. This is something the talented shoemakers at Bill Bird Shoes pride themselves on as well.